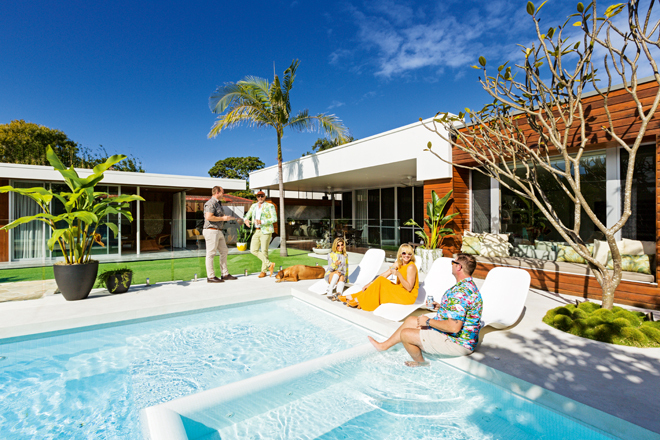 Palm Springs style is officially back in … and what’s not to love? 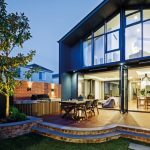 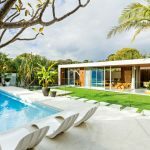 The design goal of this project, located in picturesque Byron Bay, was to create an outdoor space that exudes fun in the sun by day and glamorous charm by night. 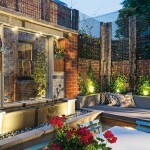 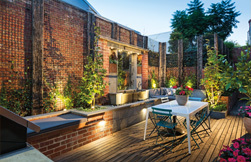 The garden was designed for its celebrity owner Shelley Craft, known for her sunny disposition, and the design brief was a natural fit for landscaper David Franklin, who has a long-running affiliation with Channel 9’s popular TV show The Block, which Shelley co-hosts. 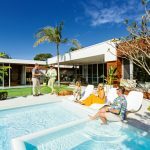 David and the Franklin Landscape & Design team were excited to work with Shelley to create a Palm Springs-inspired landscape for her family — husband Christian and their two daughters. 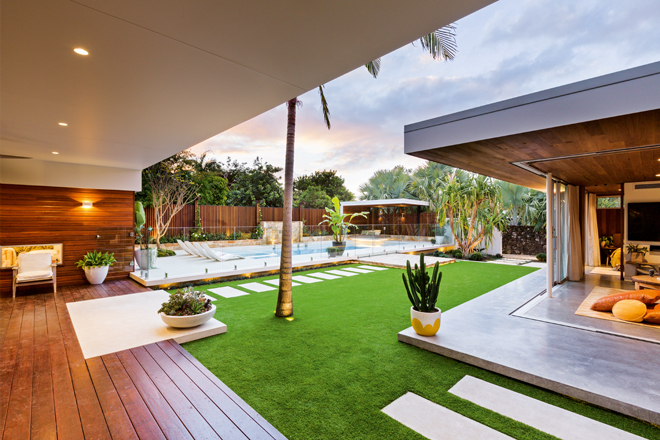 The design scope included rejuvenating an outdated pool and integrating the newly built bungalow with a generous lawn, garden beds, alfresco entertaining area and outdoor shower — and doing so with stylistic nods to the popular mid-century modern aesthetic. 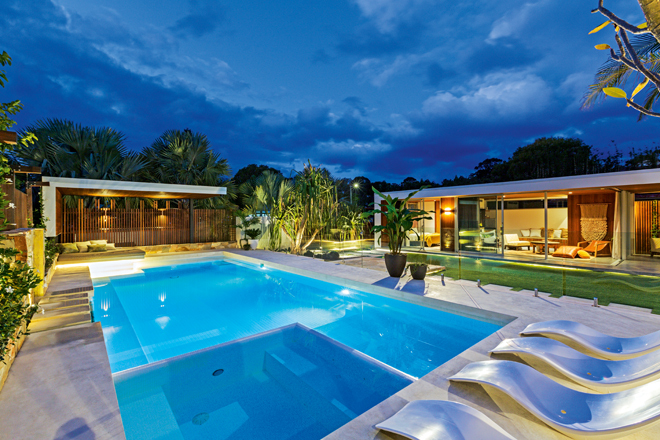 The pool renovation was an essential part of the overall design. 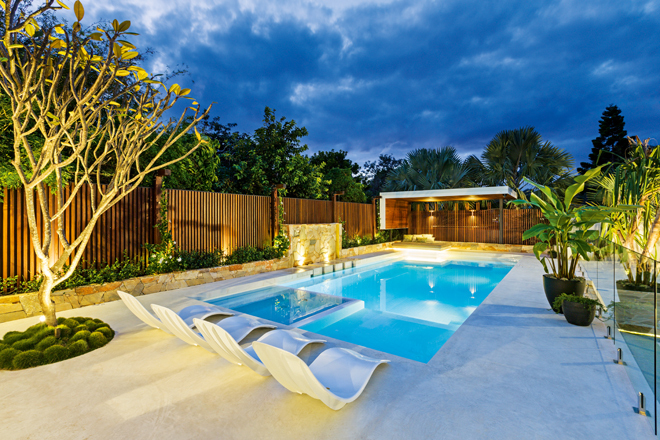 The old pool tiles were replaced with crisp white tiles which give the water a cool, fresh, light- blue appearance. 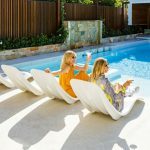 To give the space an ultra-chic resort vibe, the pool was further enhanced with a stone water feature and a cantilevered polished concrete day bed at one end. 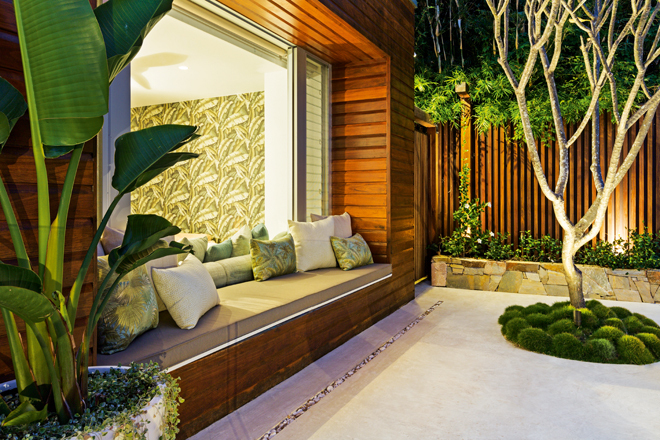 The day bed was softened by patterned custom outdoor cushions and sheltered by a timber-clad pergola. 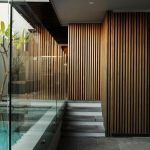 The level change stepping up to the pool area presented an opportunity for another design feature. 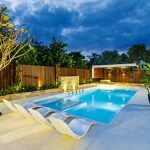 “By cantilevering the polished concrete pool surround, we created a space to plant underneath, complemented by night lighting, which integrates the transition between the concrete and lawn areas,” says David. 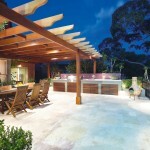 And instead of just having a step up to the pool gate, David suggested a cantilevered platform, paved with random stone. 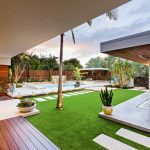 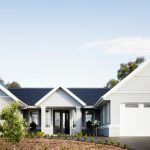 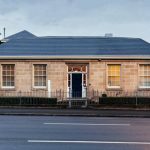 “It makes a feature of the level change and the stone provides an attractive contrast between the lawn and polished concrete,” he says. 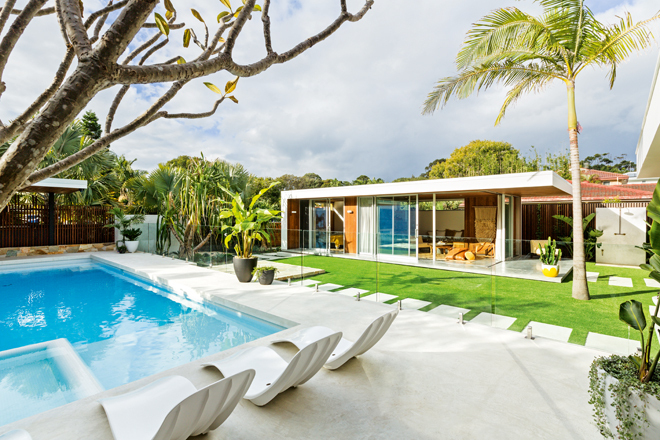 The cantilevered detail is reflected on the other side of the lawn in the porch that wraps around the bungalow, also in the day bed that “floats” over the shallow end of the pool. 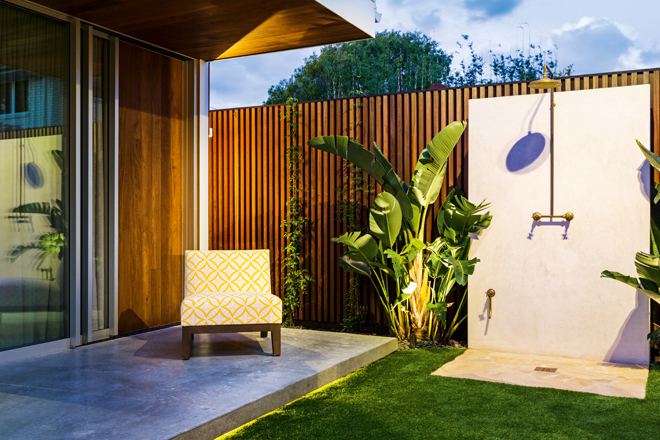 And then there are the plants … you can’t channel Palm Springs without a palm tree and some luxuriant foliage. 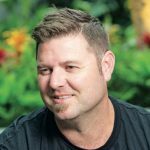 That being said, Byron Bay is in subtropical Australia, not arid Arizona, so the plant palette had to be refined to suit the geographic location. 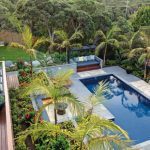 Shelley was fortunate to already have an established palm tree which retained its pride of place within the lawn area, and a pandanus tree that fitted the aesthetic perfectly. 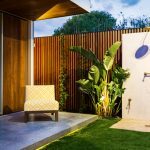 The landscape boasts many other less conspicuous but nonetheless charming details, including a locally made copper outdoor shower and embellished drain, custom outdoor cushions with subtle patterns that complement the landscape, and handmade pots containing a mix of succulents and lush plants. 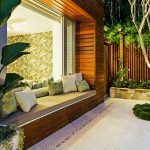 A window box provides a lovely transition between indoors and out, connecting the family’s lounge area with the pool zone, and provides an inviting nook — a place of retreat. 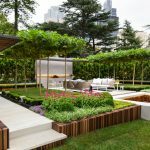 “This is an example of a distinct but integrated zone, which makes the space very dynamic but still cohesive,” says David. 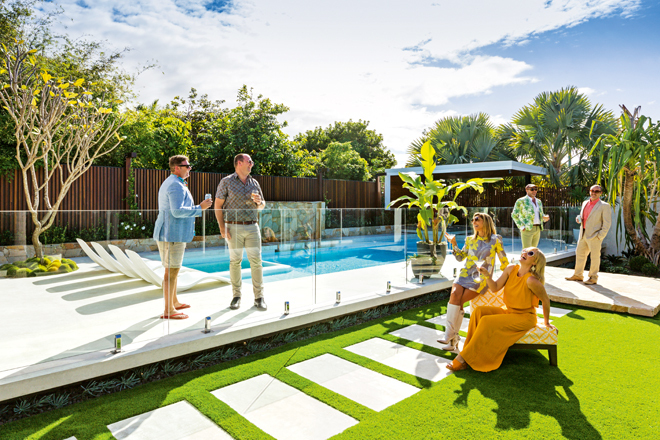 Shelley and her family are delighted with their stylish new outdoor space, which caters to their enviable lifestyle in the warm northern-NSW climate. 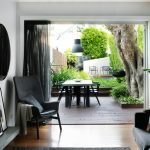 In summarising the design intention, David says, “We wanted to give them space to relax, plenty of room for the kids — and their dog — to play and, of course, scope to do what they do best … host people!” It’s safe to say the landscape successfully reflects its famous owner’s personality: stylish, sunny, and timeless in appeal.